Hi-solids silicone applied over a TPO roof system at a large distribution center in Wilkes-Barre, PA.
Give new life to tired roofing. 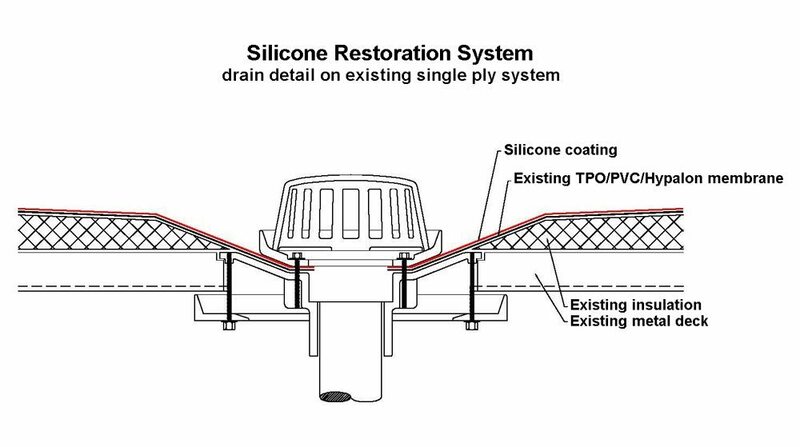 PUFF, Inc. silicone roof coating restoration (RCR) systems are an ideal way to improve the look and durability of old roofs. Elastomeric coatings can be spray- or roll-applied to virtually any roofing surface: metal, single ply, smooth BUR, concrete, etc., to achieve a smooth, seamless finish. 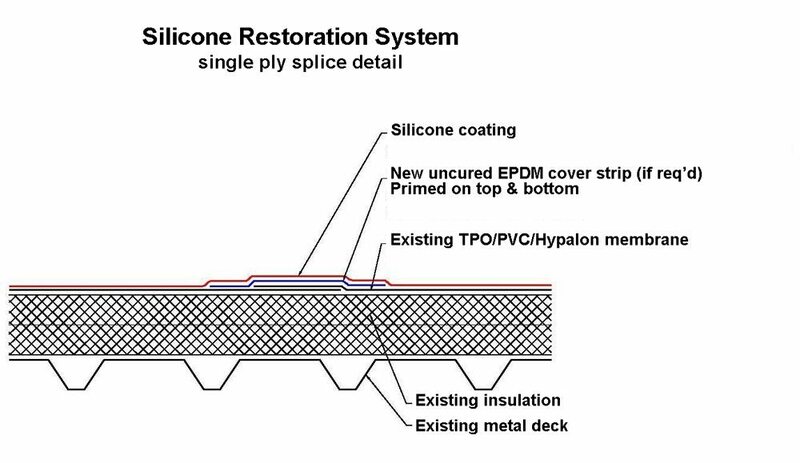 A roof coating restoration system is an energy efficient, high performance, sustainable solution for your roofing needs. Single coat application up to 40 mils. Exceptionally strong physical properties ensure roof remains water-tight and leak-free. Low VOC – environmentally safe. Silicone coating reflects sunlight and radiant heat, keeping structure cool to improve energy efficiency and reduce energy costs. With proper preparation, coatings can be applied to almost any roof surface. Save time and money – no need to replace old roofing. Up to 15-year RCR system warranty available. Roofs can be restored without tearing-off old roof thereby reducing waste and further overburdening landfills. Reduce energy costs. Many of the elastomeric coatings are Energy Star® compliant and have earned Cool Roof ratings due to their high reflectivity of harmful UV rays. Will not chalk, haze, or degrade from UV exposure. Can I recoat my roof a second time? Yes. We have many customers who have had their roofs recoated multiple times. The coating thickness depends on the term of the guarantee and the type of roof surface. 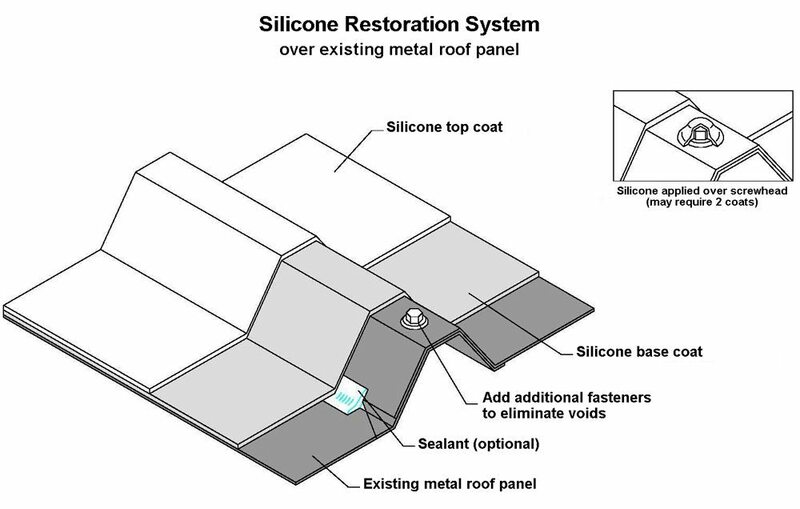 For instance, for a 15-year written guarantee on silicone coating over a metal roof, the minimum thickness of coating is 25 mils (one mil = .001”). Standard colors include White, Gray, and Tan. Custom colors are available at an additional cost. Is special equipment required for the application? Due to the high viscosity of the material, a high pressure airless sprayer should be used. What would be the typical process to coat my roof? Repair any seam failures, fastener back-outs, tears, blisters, etc. Can coating be applied during inclement weather? No. The roof surface must be clean and dry, with temperatures typically above 40º Fahrenheit.